The American labor market is increasingly unequal, characterized by extraordinary returns to work at the top of the market but rising precarity and instability at the bottom of the market. In addition to low wages, short tenure, few benefits, and non-standard hours, many jobs in the retail and food service industries are characterized by a great deal of instability and unpredictability in work schedules. Such workplace practices may have detrimental effects on workers. However, the lack of existing suitable data has precluded empirical investigation of how such scheduling practices affect the health and wellbeing of workers and their families. Schneider describes an innovative approach to survey data collection from targeted samples of service- sector workers that allows the collection previously unavailable data on scheduling practices and on health and wellbeing. He uses these data to show that exposure to unstable and unpredictable schedules is negatively associated with worker wellbeing. He then draws on these data and use a difference-in-differences design to provide the first evidence on the effectiveness of two approaches to schedule reform: company-driven changes in corporate HR practices and local laws that regulate scheduling practices. 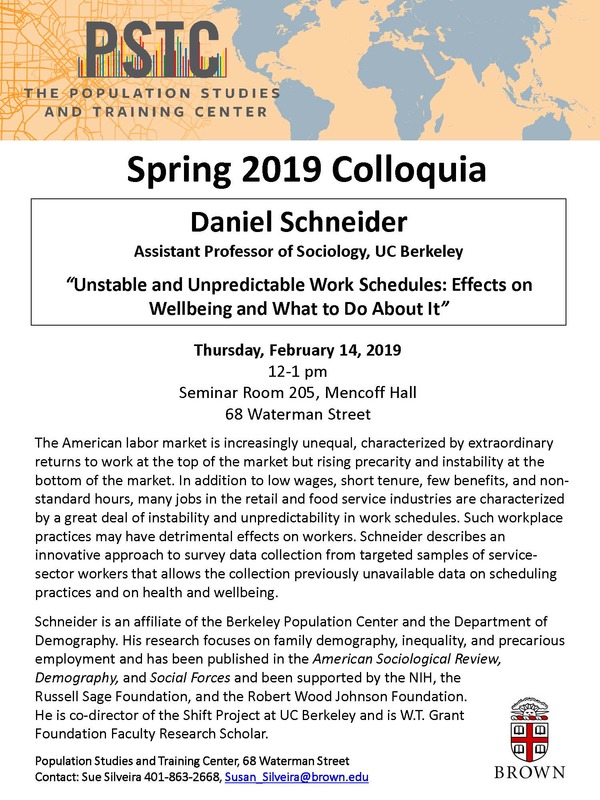 Schneider is an affiliate of the Berkeley Population Center, the Department of Demography, and the Institute for Research on Labor and Employment. He received his BA in Public Policy from Brown University in 2003 (and took his first and only course in Sociology at Brown with Michael White!) and his PhD from Princeton University in Sociology and Social Policy in 2012. He then completed a Robert Wood Johnson Foundation Postdoctoral Fellowship in Health Policy Research at Berkeley. Schneider's research focuses on family demography, inequality, and precarious employment. His work on these topics has been published in the American Sociological Review, American Journal of Sociology, Demography, and Social Forces and has been supported by funders including the National Institutes of Health, the Russell Sage Foundation, and the Robert Wood Johnson Foundation. He is currently co-director of the Shift Project at UC Berkeley and is a W.T. Grant Foundation Faculty Research Scholar.